See what my husband brought me home yesterday. Honey, fresh honey, that a patient gave him. I doubt she knew how thrilled I would be to have fresh honey. You see my dad used to raise bees. I grew up around bees and fresh honey. I love fresh honey. Store bought honey does not even come close to comparing to fresh honey. Because we raised bees, we ate tons of fresh honey growing up. We ate it on toast, in sandwiches, and my mom baked quite a bit with it. My sisters and I spent many hours helping my dad and mom process honey, which by the way is NOT a fun job. But while we were processing it we got to steal lots of bites of fresh honey. My favorite treat was to chew on the honeycomb. This fresh honey brought back memories. Tonight I ate a big spoonful of this honey. I just took a spoon, dipped it in, and ate it plain. It was SO good. I had to stop myself from eating another spoonful. I am going to make this jar last. I have tasted quite a bit of honey over the years and this honey was really good honey. Thank you Susan for the honey!!!! I know you read my site, so I wanted to let you knew how happy you made me. My father in law used to harvest honey as well. 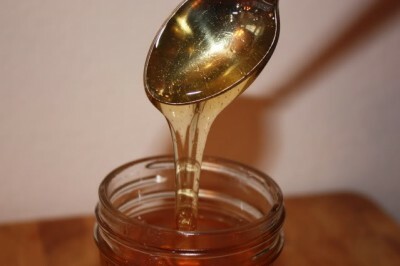 You’re right, store bought honey doesn’t even compare to the real stuff! Have you read the Secret Life of Bees? You might enjoy the parts of the story that talk about processing honey. and it goes well with so many different kinds of foods.. i love experimenting..